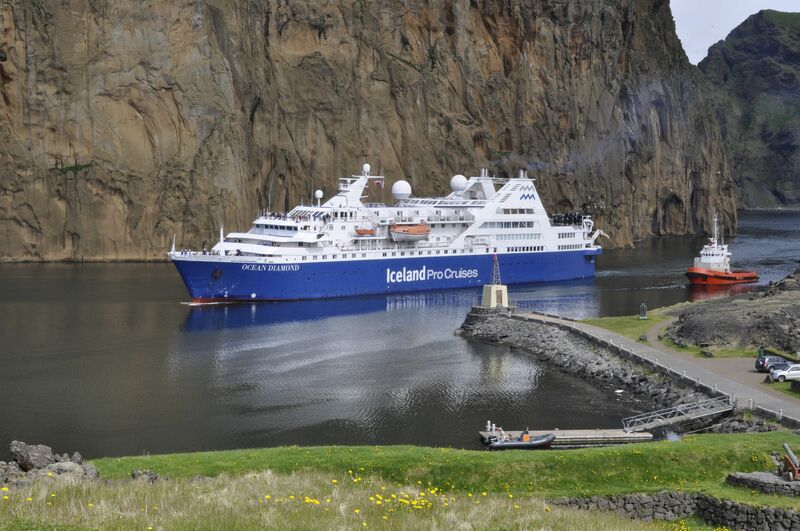 Experience an unforgettable journey around Iceland aboard the OCEAN DIAMOND. Discover this mystical land steeped in Viking traditions and volcanic landscapes not seen anywhere else on earth. This voyage reveals a diverse array of natural wonders and the Icelandic way of life. A range of exciting shore excursions offers countless ways to interact with Iceland’s unique character. Use your leisure time in Reykjavik to discover the unique charm of the world’s northernmost capital and book one ouf our pre-programs. Or explore the sights of south and west Iceland on a self-drive road trip. The OCEAN DIAMOND docks in Old Reykjavik Harbor in the heart of the city, a five-minute stroll from the main squares, shopping and dining. The ship departs in the evening. Stykkisholmur is the starting point of our adventures on the Snaefellnes Peninsula. Often called “Iceland in Miniature” because of its diverse landscapes, the area is home to bird-rich Breidafjordur Bay and Snaefellsjokull glacier, which sits atop a 700,000-year-old dormant volcano that was featured in the Jules Verne novel Journey to the Center of the Earth. Today‘s destination is Isafjordur, an idyllic town in the Westfjords region. This secluded peninsula is connected to the Icelandic mainland by only a narrow strip of land and includes many roadless areas where cars have never been. The landscape includes jaw-dropping views of dramatic fjords carved by ancient glaciers, sheer table mountains that plunge into the sea and pristine North Atlantic vegetation. By morning we reach the fjord town of Siglufjordur, once the hub of the global herring industry and now enjoying a rebirth in popularity. Learn about the golden age of herring at the award-winning Herring Era Museum located on the vibrant harbor-front. In the early afternoon we head to uninhabited Grimsey Island. Located about 25 miles (40 km) off the mainland on the Arctic Circle, the island harbors a variety of bird species including puffins, guillemots and gulls. Later we set sail for Akureyri, Iceland’s lovable second largest city. Ranging inland from Akureyri, we visit the fascinating Lake Myvatn region, where the schizophrenic landscape looks as if “heaven and hell” have clashed. One side of the lake features rugged volcanic remnants, while the other side is blessed with lush vegetation and varied bird life. In the early morning hours we steam into Skjalfandi Bay and Husavik. Often called the “Whale watching capital” of Iceland, the town’s offshore waters are home to 15 different whale species, as well as dolphins and 30 variety of bird. Watching these graceful ocean giants in their Arctic habitat is an unforgettable experience. Iceland’s East Fjords are best explored from the impossibly picturesque port of Seydisfjordur, nestled between the sea and steep mountains. Activities include seal spotting, horseback riding, and visiting the beautiful nature reserve Skalanes. Today’s port of call is Djupivogur, fishing village in southeast Iceland, starting point for an optional excursion to the amazing glacier lagoon. Huge blocks of ice constantly break off the glacier, Breiðamerkurjökull, and large icebergs float on the lagoon. The lagoon is not very wide but it is up to 250 meters deep which makes it the deepest lake in Iceland. After breakfast we bid farewell to the OCEAN DIAMOND as we sail back into Reykjavik. Explore inland areas like the Golden Circle and its famous Gullfoss waterfall via our Air & Ground package or explore the sights of south and west Iceland on a self-drive road trip. You can also simply hang out in Reykjavik, a perfect city for those who want to refresh their spirit in a place that combines invigorating outdoor activities, great food and world-class entertainment. More post-cruise programs can be found here.